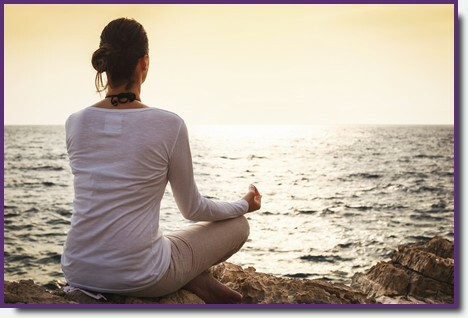 There are many different meditation techniques that are practised today, and whilst it is not necessarily religious, it has perhaps become best known through its association with Buddhism, Hinduism, New age/Pagan, Judaism and Taoism. Having become very popular in the West during the 1960s, it is currently the subject of much scientific research, particularly in the field of neuroscience. What is without doubt is that people who make meditation part of their daily or weekly ritual report that life is considerably enhanced by it. The very practice of setting aside some quality "me time," creating a space of peace and calm in our lives can be very healing in itself. Allowing ourselves time to quieten the constant chatter in our heads, listen to our thoughts and simply observe ourselves, removed from outside influences, helps to produce a state of deep peace and relaxation. Even just 5 minutes a day can be beneficial. Although of course, as you become more experienced and notice the benefits, you'll want to spend longer. helps increase your powers of concentration and enhance creativity. help you feel more centred; less pulled about by your busy world and outside influences. As a therapy tool, I create guided meditations that can combine multiple techniques, personalise for clients to aid relaxation and empowerment. This can be one a 1-2-1 or group basis, and tailored for specific aims. Just get in touch to discuss further if guided, personalised meditation is of interest to you or if you want to find out more. For a list of my upcoming class dates, CLICK HERE to visit my Workshops & Events schedule. I recorded this meditation after including it in one of my regular meditation classes, on the request of several people in the group who found it extremely powerful! Since then, I decided to make it available for download too. 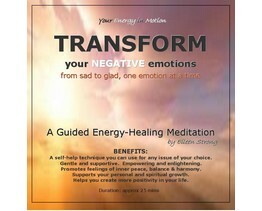 From Sad to Glad; a guided meditation CD to help you identify and transform the energy of negative emotion, one feeling at a time. I don't have a shop facility available on this website (yet!) but if you'd like to obtain a copy, the CD costs £7.00 + Post & Packing. It is finished to a high quality and comes celothane-wrapped so also makes a nice gift. MP3 version also available for download £4. Paypal accepted. Contact me via the contact page of this website to order.